A Journey Through The Cultural History Of Glass. For centuries the municipality of Frauenau has been an important hub of the Eastern Bavarian glass region. 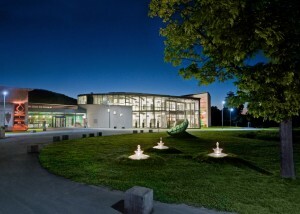 There are still three local glass factories as well as numerous glass refining craft enterprises/companies producing in Frauenau, which is also considered the most important European centre of the international Studio Glass Movement. Against this background, the Frauenau Glass Museum was founded 30 years ago, and in 2005 it was re-opened in a new building with an innovative exhibition concept. The Museum building itself is structured as a spherical glass object. A modern architecture, which was developed in correspondence with the items and the themes of the museum, conveys that the new museum wants to meet the growing expectations, regarding the presentation of the exhibition as well as its contemporary intermediation. In the new museum the multifaceted qualities of glass as a basic material are shown not only in the presentation of the exhibits but also in the architectural style and in the composition of the exhibition. Passing exhibits made from glass and symbolic glass settings, visitors go on an exciting trip through the cultural history of glass in Europe, they dive into the historical world of local people, who have been living and working with glass, and last but not least they get to know an important collection of modern glass artwork by international artists. In the museum, it is also shown the cultural significance glass has had for the neighbouring countries Bavaria and Bohemia. For more than 700 years this cross border relationship has been of great importance for glass as a traded good, as a technology test bed, or as an artistic medium. The Tour leads through all of the relevant epochs – including the Baroque. The first part of the exhibition is designed as a round tour, where visitors go on a journey through time, passing showcase settings, and innovative centres of glass production. The round tour starts with the presentation of antique glass production in ancient civilisations of the Eastern Mediterranean Regions, it continues with exhibits of glass paintings in Gothic cathedrals and archaeological finds of glasses used in the Middle Age. Crystal-clear Venetian glassware of the 15th century competes with products of forest glassworks in Central Europe, and also epitomizes the cultural and artistic dawn of the Renaissance in the exhibition. The Baroque Era is presented in a vitreous maze with luxury glassware, mirrors and crystal chandeliers made in Bohemia, which were then produced to fill the need for representation of the European aristocracy. The variety of refined glasses is devoted to the aspiring and ambitious Middle Classes, and the technological change brought about by the Industrial Revolution in the 19th century. Due to the Great Exhibition and the growing competition among nations, the production of glass experienced a very special variety in style during the era of Historicism. Passing by the opalescent glasses of Art Nouveau and Art Deco visitors finally come to examples of modern glass design of the early 20th century, and of the automatic glass production, which, with the existence of production facilities for hand-made glasses, has been threatened as inevitable up to now. 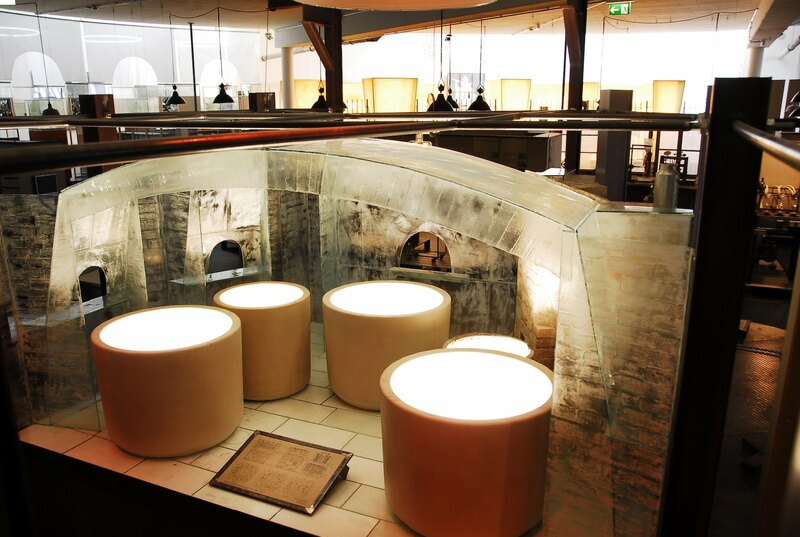 An oven for smelting glass is at the heart of the museum. The second round tour is called “Living and Working with Glass”, there the social and cultural aspects of a glassworkers’ settlement are displayed with authentic reports on the persons concerned, arranged around a model melting furnace and a collage of exhibits, interviews and photographic documents. In doing so the exhibition consistently avoids any doll house like reconstruction, but gives examples of the individual steps in the process of glass production, which were really experienced by witnesses to history – and collected in the time period between World War I and the present day. This documentation of social history – the history of everyday life – drastic and in touch with reality reveals the changes in the working environment and reflects the far-reaching and dramatic results of globalisation and industrial automation in the present day. The closing-down of glassworks in the Bavarian Forest and the question about the uncertain future of the glass industry are visualised, and possible solutions to overcome the crisis are indicated. In the third part of the exhibition the artistic solution is displayed presenting a comprehensive collection of vitreous artworks by international artists from 1945, as well as documenting the history of the International Studio Glass Movement, which started in 1960 in the USA. The artist Erwin Eisch from Frauenau was pioneer of this movement in Europe and is represented with some emblematic pieces of his work in the above mentioned collection. The permanent exhibition in the museum is made perfect through various study collections including most important glassware, the snuff bottles of the Collection Schaefer, and an internationally representative profile of reverse glass paintings, which belong to the Collection Udo Dammert. Furthermore the museum also puts on temporary exhibitions, and has a substantial library with expert literature as well as an archive of historical glassware; both are at the interested experts’ disposal. A series of articles regarding individual topics or Bavarian – Bohemian aspects of glass history is continued.